Supernatural ends its thirteenth season with the arrival of Michael into “our” world an further exploration of the Lucifer/Jack dynamic. I mentioned last week that I had no idea what this season finale would be about and I certainly could never have predicted what would come to pass here. The most striking thing about this episode is how understated it is, at least to begin with. It feels like a fairly standard midseason episode for the first act before the situation rapidly escalates in a way that season finales often do. Looking back at those early scenes makes it clear why they are important in the context of the episode as well as the season as a whole. This season has been driving home the family angle and making it clear that it’s a definition that can be stretched in many different ways. In the beginning this season was focused on Dean accepting Jack as Sam fought his corner because he believed that being Lucifer’s son wasn’t enough reason to write him off completely. We’re at the end of the season now and Dean has fully accepted Jack into his extended family. 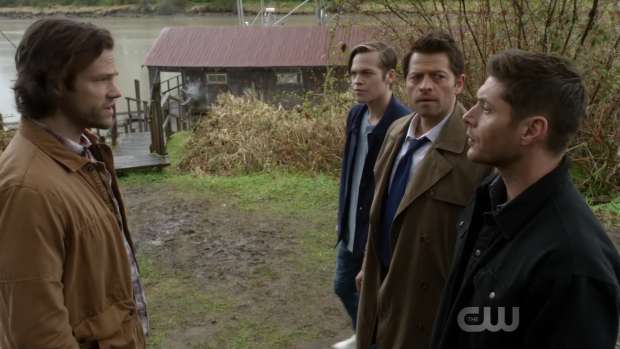 The scene where they discuss bad dreams and Dean makes it clear that Jack is part of the family is really effective because it has been well earned. The prospect of retirement comes up again. This was brought up before when it appeared possible that all of the evil in the world could be removed but hasn’t really been raised since with there being constant problems to be dealt with. This comes early in the episode when it appears that Lucifer and Michael are trapped in the other world while Jack, Mary and duplicates of people they cared about are safe in “our” world. I’ll confess I don’t remember the particulars of what happened to the tablet that could banish all evil from Earth but I wonder if this is an eventuality that Sam and Dean will choose to pursue again once things settle down somewhat. The conversation between Sam and Dean is an interesting one as it suggests they are both at the point where they would like to see this life come to an end. They both agree that they’ve earned it and that’s certainly something that isn’t in dispute. Sadly the episode doesn’t do very much with the duplicate Bobby or anyone else that crosses over from the alternate universe. Sam teaching them the history of his world is amusing enough though causes some confusion since Donald Trump is the President even though Supernatural did an arc where Lucifer possessed the President of the United States and he wasn’t Obama or Trump. This doesn’t really make sense within their own continuity. Mary doesn’t have an awful lot to do either other than fill in some dialogue and sadly Castiel is much the same. I can see why the decision was made to sideline some of the other characters in favour of focusing on Sam, Dean, Jack and Lucifer but it does feel like some opportunities have been missed. At least there is always next season. In many ways this episode is about Jack deciding who his family is now that he has options. Lucifer’s return brings temptation with it when he literally offers Jack the universe. It’s another example of Lucifer being manipulative to achieve his goals and an extension of what he was doing last week with a very different flavour. 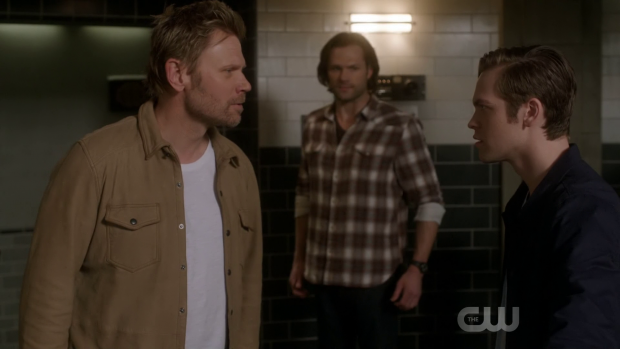 The previous episode had Lucifer show vulnerability to Jack in an attempt to prove that he was legitimately interested in having a meaningful relationship with his son. It was almost enough to fool me thanks to how well Mark Pellegrino performs this role but there’s always that undercurrent of dishonesty to everything he does. The approach suggested that Lucifer had perhaps deluded himself into believing what he was saying even though he’s incapable of change as Gabriel pointed out. This episode sees him changing up his strategy from false honesty to blatant manipulation though the most dangerous thing about it is that Jack is initially unable to see it. A large part of that is because he tries to see the best in people so wants to believe that Lucifer has the capacity to redeem himself or at least be genuine in his desire to try for the sake of their father/son relationship. This is perfectly reasonable as far as Jack’s concerned because he struggles with his potential to be either good or evil so wants to believe that his father isn’t as evil as practically everyone says he is. He’s prepared to make up his own mind and is understandable confused by all of the information that is presented to him. His decision to provisionally trust what Lucifer has to say while testing the authenticity of his claims is an interesting development. 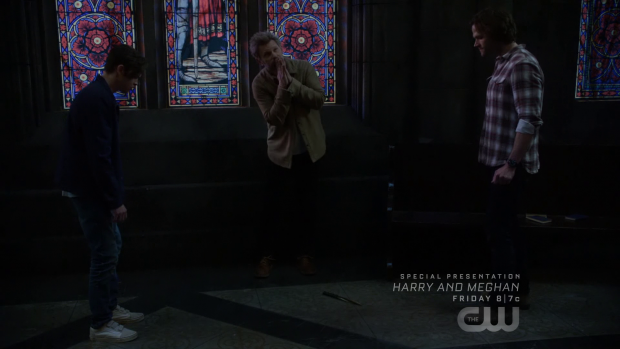 The episode plays with the idea of Lucifer being an ally to Sam and Dean again by having him enter the Bunker and resurrect the recently murdered Maggie (Katherine Evans). Doing this serves as some form of proof to Jack that what Lucifer tells him is genuine. It’s a gesture that Jack chooses because he blames himself for Maggie’s death to some degree and wants to see that undone. Lucifer does what he’s asked though warns Jack that resurrections sometimes cause people to come back wrong which is consistent with what this show has established about the process in the past and suggests that the rest of the episode might explore that idea in relation to Maggie. That doesn’t happen because Maggie is a simple plot device to distract Jack -and the viewer- from Lucifer’s true intentions. She is brought back from the dead because someone needs to relay the information that Lucifer killed her and who better to do that than the murder victim herself? Attempting to make Maggie an actual character before or after her death and resurrection would have made her role in the episode more impactful but she is the embodiment of an obvious plot device which makes the scenes devoted to mourning her death lack any real weight to them. Learning that Lucifer killed Maggie is a turning point for Jack. Regardless of how poorly developed she was it’s clear that Jack cares about her and everyone else he fought alongside in the other universe so the loss is a visceral one for him. Knowing that his biological father was responsible is difficult for him to accept and hearing him say that Humans don’t matter visibly upsets him as well as disgusts him. Jack has forged meaningful relationships with Humans in his very short life so can’t believe that his father doesn’t see them as worthwhile. This is what makes Jack decide to disown Lucifer as his father and stand with the Humans against him. The episode shifts gears once everyone learns that Lucifer killed Maggie and puts him back in the role of the villain. Mark Pellegrino’s performance changes accordingly to accommodate Lucifer completely honest about his intentions and it’s great to see. There’s a certain brutality to learning that he only cared about Jack because of what he wanted from him. I do think that on some level he did genuinely want a relationship with Jack though I suspect he didn’t really care whether or not he got to have one. He does say that he can make more children so his lack of empathy for Jack or anyone else comes across clearly. Normally I’m not a fan of the removal of nuance from a character but in the case of Lucifer it feels appropriate. The depth is there within the character so we as viewers know it’s there. The conscious decision to cast that aside in favour of Lucifer being pure evil is a bold one yet makes for satisfying viewing. Mark Pellegrino clearly relishes the opportunity to chew the scenery and it makes sense on a narrative level for Lucifer to abandon his manipulative tactics in favour of being completely true to himself. At that point it was clear that there was no way he could convince Jack to do what he wanted so the more direct approach is warranted. In the absence of Jack’s cooperation Lucifer takes his grace instead and becomes even more powerful as a result. He also takes Sam hostage causing Dean to become very distressed. The urgency of the situation is shown through Lucifer ordering Sam and Jack to kill each other otherwise Lucifer will destroy the univerrse instead. I suspect this is an example of hyperbole but it’s clear that some form of rampage will result from non compliance. Both Sam and Jack are willing to sacrifice themselves to prevent that. Jack staking steps to end his own life is really moving and the culmination of his season long character arc dealing with him finding a sense of belonging. As I’ve said, family is a repeated theme that this show explores so Jack’s attempted sacrifice shows that he feels a belonging to the family he has found for himself. Fortunately for Sam and Jack a sacrifice isn’t necessary as Dean makes the really costly decision to become Michael’s vessel so that he can take on Lucifer. 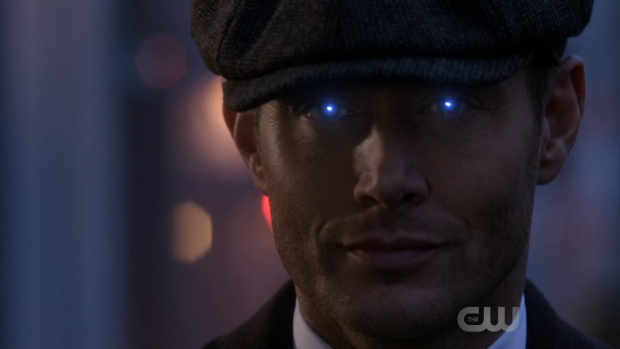 This furthers an idea from all the way back in season 5 when Dean was destined to be Michael’s vessel and was being prepared to fight against Lucifer when he inhabited his ideal vessel, Sam. The latter doesn’t happen in this episode but Dean makes the sacrifice in order to save his brother after Michael’s current vessel is badly injured. This results in a great fight -that admittedly involves some dodgy wire work- between Lucifer and Dean/Michael resulting in the death of Lucifer. I was really surprised by this outcome and always thought that Sam would be the one to deliver the killing blow but having Dean do it while inhabited by Michael makes for a satisfying ending. It’s always possible that Lucifer could come back in some form but there’s a real finality to his death that we haven’t experienced before any other time the character appeared dead or defeated. The burned wing symbol on the floor seems to confirm his demise though with this show anything is possible. Lucifer”s death makes a lot of sense at this point because it allows the writers to quit while they’re ahead with this character. He has been a fan favourite since his introduction thanks to Mark Pellegrino’s excellent portrayal and hasn’t ever got to the point where I found him to be tedious. Letting the character end on a high note is definitely a good strategy because it allows him to be missed rather than have the fans be glad that he’s gone. In terms of his arc he has basically gotten to the end of his usefulness and come full circle back to being a villain after taking a compelling and entertaining detour to return to that point. In many ways this season has been about self realisation for Lucifer and his life ends once he fully accepts what he is. Funnily enough in the space of one week I’ve gone from watching two shows featuring Lucifer to no shows featuring Lucifer. Dean’s decision to let Michael possess him makes a lot of sense because it is motivated by a desire to protect his family. Sam and Jack are in trouble so he doesn’t hesitate to throw him into a dangerous plan that might result in their survival. He doesn’t rush into the decision and tries to set a condition that will hopefully ensure that he gets out of it in one piece. 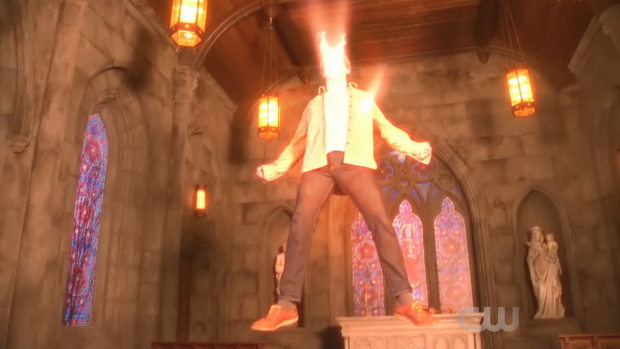 His stipulation is that Dean remains in control of his own body with Michael supplying the power. 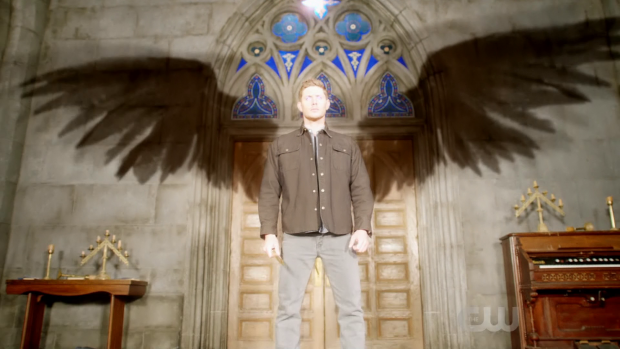 This allows Dean the necessary power boost to take on Lucifer and protect his family without losing himself to it. The fact that it’s Dean in that fight is important because his vendetta with Lucifer is personal and has been a part of the background of this season. Sam has more animosity but Dean has no love for him either especially when he places those he cares about in danger. It proves to be a mistake when Michael betrays the terms of their agreement and takes control of his body. This was always going to happen and it can be argued that Dean was so blinded by concern for Sam and Jack that he didn’t see it coming. I don’t personally agree with that argument though would be willing to accept that Dean saw this deal as the only option that would allow him to face Lucifer. Ultimately it works out but there’s a high cost when Michael takes over before leaving Sam and Jack behind wondering how they’re going to deal with the problem. The final shot of the season showing Michael dressed very differently to how Dean would normally dress is nicely ominous and sets things up well for next season. A satisfying finale that builds gradually towards an exciting conclusion. the early scenes feel like they could come from any midseason episode though it proves to be very deliberate as it drives home the family angle that has been significant over the course of the season. A big part of the episode is about showing that Jack feels he belongs to this family he has found himself a part of so the episode spends a lot of time making that believable. Dean’s acceptance of him as part of the family resonates effectively after his reluctance to even be in the same room earlier in the season and it keeps building from there to the point of a satisfying conclusion. Lucifer literally offering Jack the universe as incentive to go with him is classic manipulation from him that both differs and acts as an extension of what was delivered last week. This eventually results in Jack learning what Lucifer is really like when he finds out that he murdered Maggie because she saw him and didn’t see a problem with it as Humans don’t matter as far as he’s concerned. Lucifer’s attitude changes at that point and he proves how self serving he is when he points out that he can always make more children so doesn’t really care about Jack. Having Lucifer killed in this episode feels about right as we are at the point where he has been through a journey and decides to be true to himself. At this stage he will be missed rather than hang around long after he becomes tedious. Dean allowing Michael to possess him so that he can kill Lucifer makes sense because he’s sacrificing himself for his family while trying to make sure he comes out the other end of it. It’s a long shot but it feels like the only way for Dean and the whole thing backfires on him. The fight between Dean/Michael and Lucifer is really exciting despite some dodgy wire work and results in a meaningful conclusion to the antagonistic relationship that has existed between these characters for a long time. Next season definitely has a lot to play with in terms of storytelling. The immediate problem is Michael running around in Dean’s body. It’s unclear how long this plot thread will last though I suspect it will be resolved fairly quickly as shifts to the status quo that has one of the brothers out of commission rarely last long. I suspect this is due to fans enjoying seeing Sam and Dean bounce off each others. Michael mentions in this episode that he wants to rule this new world but do it better than he did the other so the first objective will likely be restoring the Angels and have them accept him as a leader. The Angel extinction thread should tie naturally into this but even if it doesn’t it’s a lingering issue that has to be addressed. 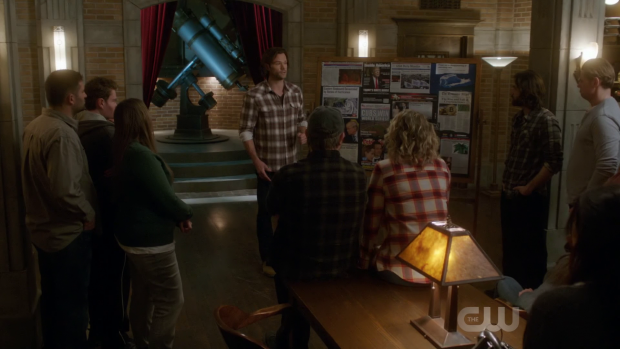 All of my speculation about the residents of Heaven returning to Earth as Ghosts at the end of this season was inaccurate but this is still something that could happen so it’s very possible that Sam and Dean will be involved in some plan that restores the Angels to a version of their former glory. Jack will likely come into this as well assuming his abilities are restored. Last week’s episode ended on the promise of regrouping before returning to the alternate universe in order to liberate it. This is almost certainly on the table as Alternate Bobby doesn’t seem to be the type to run from a fight. Mary has found a sense of belonging there as well so it’s unlikely that this thread will be forgotten about. While they all come together to form something cohesive or these ideas are treated as vignettes within the season is as yet unclear but Supernatural is on a strong footing for next season with lots of interesting ideas that are rife for exploring. This finale didn’t work for me other than the dynamic between Lucifer and Jack. Mark Pellegrino and Alexander Calvert really carried the episode. Jack/Alex has been a wonderful (if mostly underused) addition to the cast. Once again the Winchesters were mostly witnesses to the story development between other characters. The final epic battle between Dean and Lucifer was so poorly done I was mostly just embarrassed for Jensen and Mark. The cheesy freeze frame at the end just seemed to punctuate the lack of emotion I was supposed to be feeling. Also Dean’s screaming “We had a deal” to Michael made Dean look foolish. I would have preferred that Dean looked at Sam instead and said “I’m sorry, I did what I had to do”. How could Dean Winchester and all of his history with angels (particularly archangels) not know how that ill advised decision was going to end. Why didn’t Dean take Castiel with him? Was Misha not available for filming that day? Another main character with very little to do. Sam’s look of pure joy when his arch nemesis was finally (maybe) dead was perfect. And that was about it. The rest was a little boring.